Emmie has been inviting everyone she sees to the puppet show on her birthday. This puppet show is something she has been putting together all on her own for months. She has made more than 30 puppets. Every day she brings home 1 or 2 pictures that she colored at her after school program. At home she carefully cuts them out and tapes a craft stick to the back. I should probably sit down with her at some point and put together an outline. She has also told me that anyone who talks doesn’t get cake. She has never been one for performing but I guess this is different. Yesterday she told me that she’s doing a play – 2 plays really: 3 Little Pigs and Jack and the Beanstalk like in her Leap Frog movie. She spent the entire ride home from mandolin practice telling me all the ins and outs of costumes, scenery and actors. She has hired me to do the costumes (and was disappointed when they weren’t done this morning) and is planning on getting actors from her class including getting the giant from the big kid classes. I asked her if she was going to be in it and she said no. So as the Producer (and costumer) I guess I need to find a venue. I told Emmie we had to do something fun together and after she cried and whined for tv for 10 minutes*, she came up with a butterfly party. 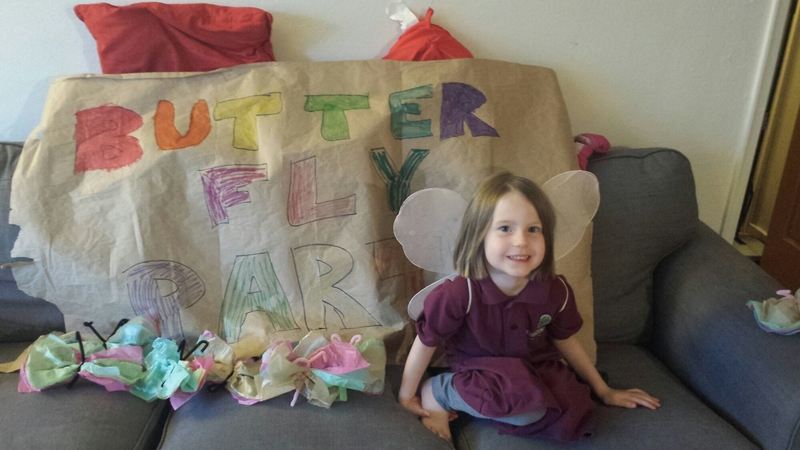 We gathered together all our butterflies** and made a banner. Then we put on our fairy wings*** and Emmie sang a song about butterflies. Finally, we threw them up in the air and danced around. It was pretty spectacular. *She’s super obsessed with a movie on Netflix about Disney villains with ghost stories. If you know Emmie, this isn’t surprising. **What, you don’t have butterflies just sitting around? I quit coffee because I would get terrible headaches when I didn’t have coffee so I would have to drink it even when I wasn’t tired. Turns out the headaches were not from caffeine withdrawal. 2 weeks in and I’m still getting headaches. The coffee was treating the headaches! I think the headaches are from stress, which I store in my neck and shoulders just in case I need it later. Exercise can help so I definitely need to start that again. Also, relaxation. So, how do I relax? I don’t, really. Watching TV is relaxing but it wears off immediately. Massage relaxes me completely and lasts for a while but can be expensive. Last Fall I got frustrated with buying pants for Emmie only to bring them home and realize that they were too big in the waist and too short in the leg. So, I started sewing for her. It’s just as crazy as it sounds. But, I made 2 pairs of leggings for her that fit pretty well and then this winter I made 3 pairs of fleece pants that fit perfectly. 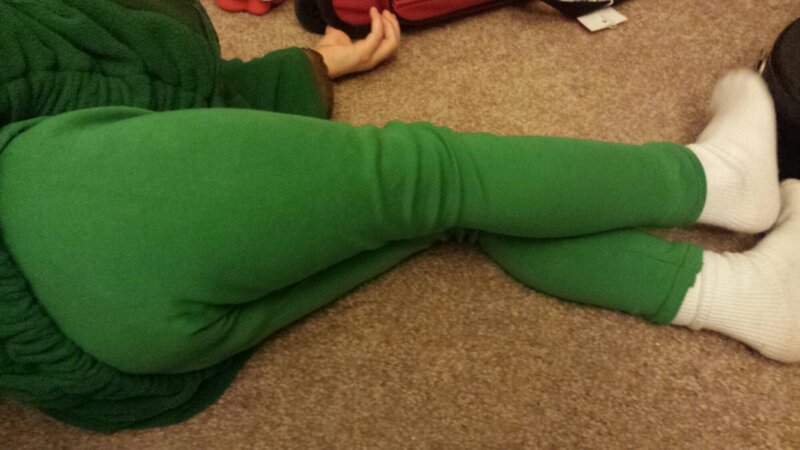 Here is a weird picture of her green leggings. I made the 2T (2 year old) size and added 4 inches to the bottom. Yes, she is 3 years old. You can see that the length is fine but not great. Today it was finally warm enough for her to wear leggings again so I pulled out the green pair only to realize that she’s grown 2 inches since I made these. Also, the waist is still a little too big. Luckily, I still have a lot of this green. I will be whipping up a new pair of 2T leggings with 6! inches added to the bottom. Good grief! Now if only I hadn’t broken my last needle. I guess I’ll have to go to the sewing shop. Poor me! 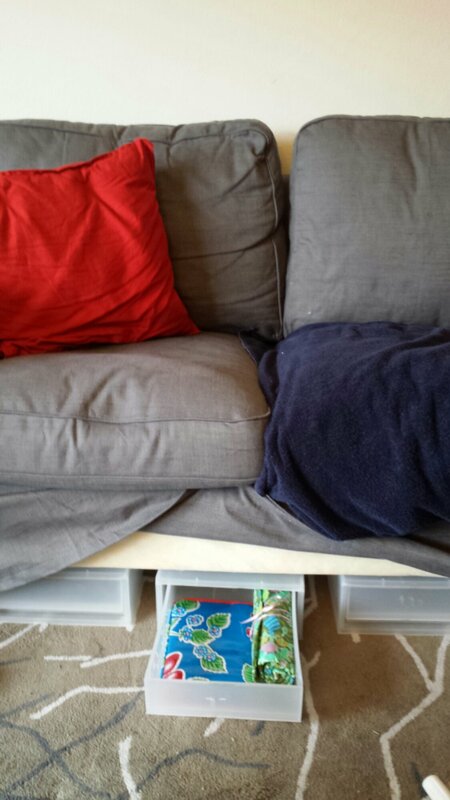 Between toys and books and knitting, the living room is usually a mess. I always like coming up with ways to contain the clutter. Little household hacks like this are my favorite thing. I always feel so clever and awesome when I think of them. I have a lot of them, too so I may start sharing more. In February I moved from Chicago to Minneapolis. It’s a little cooler here and a little less frantic but otherwise it’s a similar culture and climate. But over the last 6 months I have noticed a few things that I can only chalk up to the decreased pollution. Emmie has my very, very sensitive skin. We both need fragrance free everything or we get a rash. I had been rubbing her down with Vaseline every night since she was born or her skin got pink and pebbly. If I forgot for more that one day she got red lines under her knees and elbows. I used (fragrance free) body oil after showers and hand lotion after washing. When I was pregnant, I developed rosacea. It started out looking like little red spots and just got worse. I got very sick of people asking if I just come in from outside. I got a cream from the doctor that mostly helped but I was still pinker. Since moving to MN, neither of us have had skin issues. And we moved in winter when it is the driest. Occasionally, I will have to doctor some spots on Emmie’s legs or moisturize my hands but for the most part we are cured. I even stopped using my rosacea cream because it was drying out my skin too much. Every winter since she was born Emmie has gotten sick in October and had a night cough until spring. We would run humidifiers, rub VapoRub all over her and it wouldn’t help. I would take her to the doctor and they would say that it was viral and it would go away. It never did. Until we moved here. Emmie has not coughed at night since we moved here. She’s been sick, she’s snored (she snores all the time) but none of those dry, body racking coughs that would keep me up at night with worry. We moved here for a lot of reasons and I am so glad we did for a lot of things I didn’t expect. This is one of those things. We are spending a lot less on chapstick, too. Olinga pointed out that I hadn’t posted in almost a year so I thought I’d break my silence with a fire. Yay! So, I was heating some oil in a pot while chopping vegetables. Emmie was helping by handing me bowls. 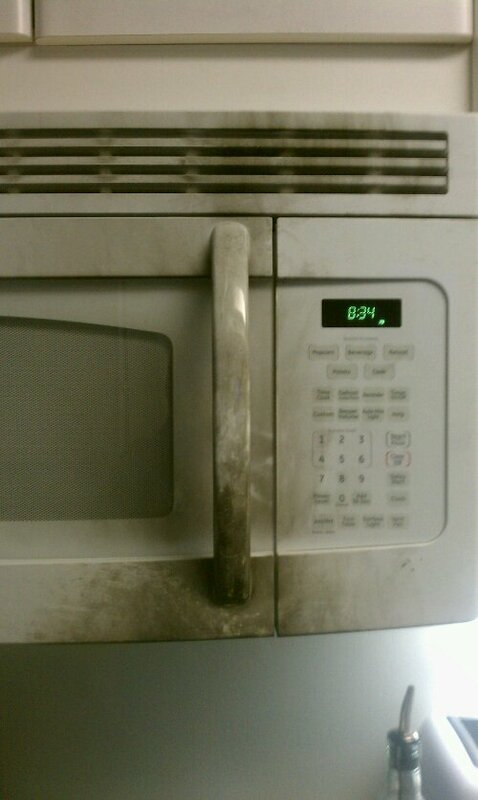 I heard a FWUME and turned around to see flames shooting out of the pot onto the microwave. I yelled to Emmie to go find her daddy and slammed a lid on the pot. I found out later that Olinga had come out when he heard the alarm, scooped her up and fled to the bedroom. It took a bit to find the smoke detector but after fanning it and opening windows, the smoke started to dissipate. Hopefully the smoke in my lungs will start to fade as well. I’m proud of my cool in the face of emergencies like this and of Olinga’s trust that I would take care of the issue or ask for help if I needed it. I’m also proud that Emmie listened even though she was terribly scared and was heading to her daddy when he found her. Next time, though, I’ll figure out where the smoke alarm is before a fire happens because that noise was scarier than the fire for all of us. I have been watching copious amounts of TV for years. It keeps me company when I clean. It keeps my ears occupied when playing video games. It keeps me going when I’m knitting. This blog has always been for random life things and knitting. I didn’t want to talk about TV here because I felt a little embarrassed about how much TV I watch. It will also include Bears football and movies. You may even get some baseball if I’m lucky enough to catch a Twin’s game. Emmie has very specific tastes and views about everything but especially food. She’s not picky, she’ll eat most things…as long as you don’t have something better. If I am in the kitchen or eating something, she screams until I give her some. If I don’t, she throws her body on the floor. Of course, she does this about 10 times a day so that’s not new. I usually give her a sippy cup to pacify her in order to give the microwave time to do its job. I try to make all her food in advance because of all of this. Once in the high chair, she plays, eats, plays eats and screams. I have to pay very close attention because she will be eating very slowly and then all of sudden she’ll be out of food and screaming. She knows the sign for more but has realized that if I’m not looking at her, signing doesn’t do any good. So, she screams and then signs more when I look at her. I guess that’s a little better. 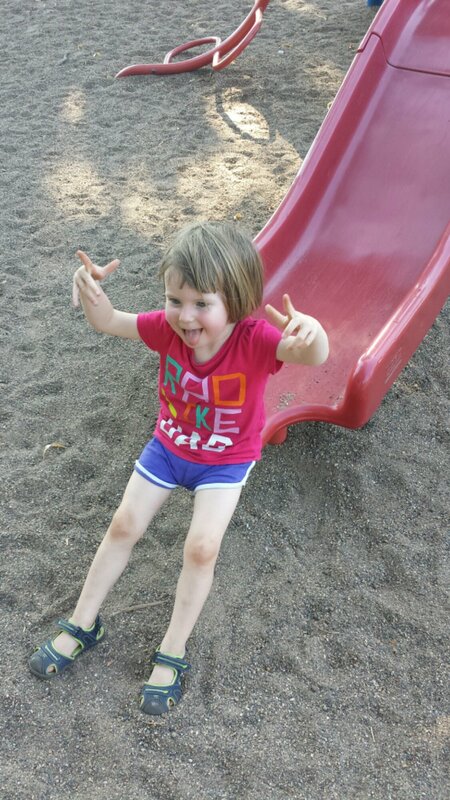 Her favorites are melon, strawberries, bananas – really any fruit – cheese and anything with cheese on it. Seriously, she could make a meal of fruit and cheese and be blissfully happy. I cut up peaches and other fruits into baby size pieces and freeze them so I can just defrost and serve. Cheese I shred and she just stuffs it into her mouth in large handfuls. The one problem with serving her fruit and cheese is that if I have something else, she wants that. And she screams about it. I have figured out that if I give her a tiny bite of my food, she will eat several bites of her own food before demanding more of mine. I have taken to eating very quickly in order to get rid of temptation. Even if we’re eating the same thing she sometimes thinks mine is better and demands it. Yes, she really does scream this much. Luckily, it’s not really that loud or ear-piercing as some kids’ screams but I’m still hoping it’s just a phase and once she can say ‘more’, she’ll stop screaming. Right?